Taken with Olympus E500 digital camera February 28th 2008. Click image for larger view. In this macro picture you can see a common limpet (Patella vulgata) covered with barnacles (Semibalanus balanoides) at low tide. 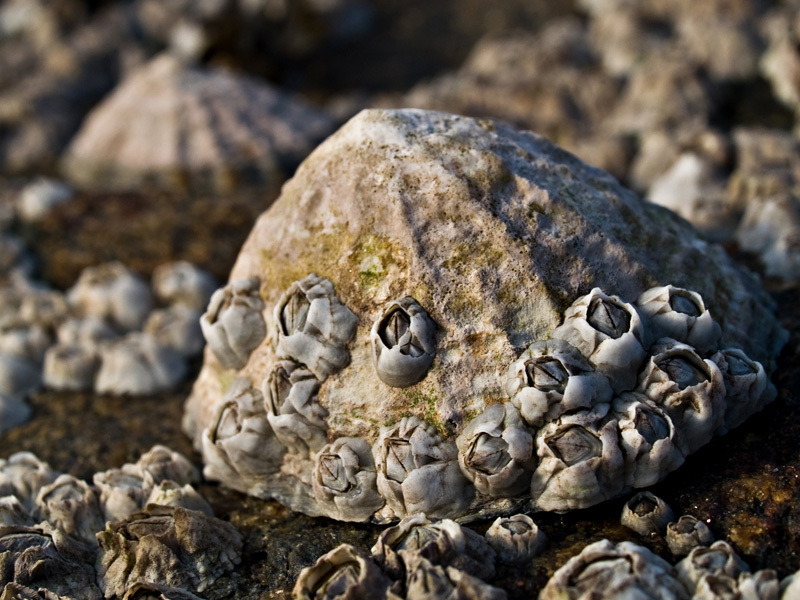 The limpets are snails that feed on algae living on hard rock and stones. They are able adhere themselves strongly to hard surfaces and can be very hard to peel off if they sense danger. If you look in the background you can see another limpet waiting for the tide to come back in. The barnacles (Semibalanus balanoides) seem to get a free ride with the limpet, but I’m guessing the limpet is glad for having some extra camouflage. Check out this photo of the shell of a limpet filled with small pieces of sand. The inside have some beautiful structures and colors. Mmmmm…limpets. I wonder if you could just pop them straight down like an oyster? Perhaps they would be tasty in a soup, perhaps a limpet chowder? I’m guessing they wouldn’t taste all that different from an oyster. I always found it amazing that space is at such a premium in the ocean that animals live on top of each other. Great shot. From what Ray Mears said they are a bit different and quite chewy! The good thing is that they are much safer to eat than shells who filtrate water. We have a similar limpet here in Hawaii. The Hawaiian name for limpets is “opihi” and it’s a very popular food in the ethnic Hawaiian culture. They are indeed chewy, though, and can have quite a strong flavor. Your pictures are awesome! And what a beautiful place to live! Your photos are absolutely amazing! They’re a breath of fresh air. Wonderful macro! The light is great. Hi Tom! Thanks for visiting my blog. Your pictures are beautiful…thank you for transporting me for a little bit. I love this one. Hey, great shot. I love macro photo’s and once I get my new camera, I’m hoping to delve into it myself! I’m currently writing a biology report on limpets, more specifically patella vulgata and was wondering if you could give me permission to use it? it would be of great help and you would be cited in the bibliography.